Until 1986, when it was acquired by H.R.H. Prince Sultan bin Salman Al Sa'ud, the old farmhouse at al-'Udhaibat was a tumble-down, neglected mud-brick ruin, no different from many other such buildings which have survived in Saudi Arabia from before modernisation. It was unmaintained and - as all buildings of sun-dried mud will, if left - was quietly subsiding into oblivion. Al-'Udhaibat is situated just north of the metropolitan sprawl of modern Riyadh, in a location of special resonance for Saudi Arabians. For it lies in the great Wadi Hanifah, just south of al-Dir'iyyah, the old, ruined mud-built capital of the First Saudi State and hub of the 18th-century Islamic reform movement. 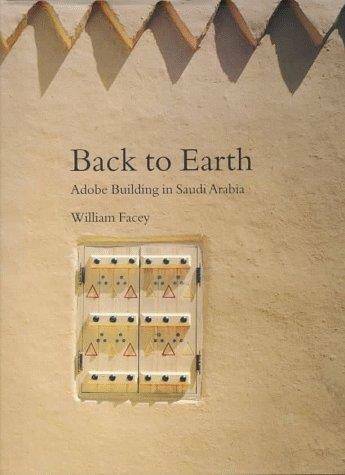 How the attempt to restore this modest farmhouse, once owned by the late King Faisal, developed into a complex project with important implications for rural housing and the place of traditional materials in modern building, is the story told in this book. Al-'Udhaibat remains a test-bed, its performance under constant scrutiny, and a source of inspiration for the new generation of Saudi architects. Topics covered in this lavishly illustrated book, aimed alike at architects, planners and general readers, include: The role of vernacular style in modern architecture; The environmental and historical setting of al-'Udhaibat; Traditional techniques of adobe building in Najd; Issues in adobe restoration and re-building; The re-building process in detail; The reclamation and re-conditioning of the farmland; The future of adobe in the modern world. Prince Sultan bin Salman Al Sa'ud is a grandson of the late King 'Abd al-'Aziz and a nephew of the late King Faisal. He is perhaps best known to the general public for becoming, in 1985, the first Arab astronaut. He is today, however, equally prominent as an opinion-former, and his commitment to Islamic values and his concern for architecture and the environment are well-known. He is currently the President of the High Commission for Tourism in the Kingdom.